In order to understand the effects of Cannabidiol (CBD) in the body, we need to understand the Endocannabinoid system (ECS) which is present in all humans, vertebrate animals and even some invertebrate animals also. ‘Endo’ stands for inside the body or endogenous and cannabinoids are the group of chemicals that affect the system. The endocannabinoid system is already present in the body and already being activated by naturally occurring cannabinoid molecules whether or not you are using any cannabis or CBD products. Using CBD and other cannabis derived products stimulate and activate the endocannabinoid system. Cannabinoid receptors, endocannabinoid molecules, and their metabolic enzymes, is a crucial molecular system that the body uses to help maintain homeostasis. 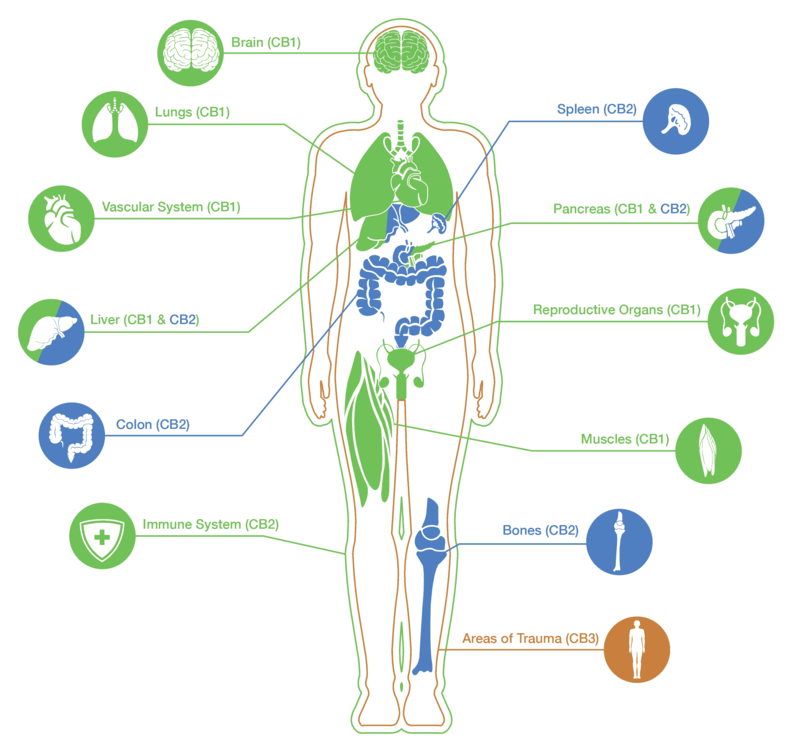 Cannabinoid receptors [primarily CB1 & CB2] sit on the surface of cells all around the body and measure the outside cell conditions then transmit information inside of the cell, implementing the appropriate cellular response. The endocannabinoid system is directly responsible for managing critical bodily functions such as appetite, mood, sleep, metabolism, inflammation and the ability to ward off infection or disease. Because of its vital role in making sure that cells and systems remain in their physiological equilibrium, the ECS is tightly regulated; it gets deployed exactly when and where it’s needed. After the endocannabinoids perform their necessary function the metabolic enzymes present in the ECS immediately break them down. Unsure which CBD product is right for you?